You are currently browsing the archives for the Jataka tales on Lord Buddha’s life EN category. The compassion of the Buddha touches every living being. Resonates throughout all his former lives. Pg 3 – Before he became the Buddha, the Bodhisattva, in a series of lives too numerous to mention, through his wisdom blessed the world with countless demonstrations of his compassion, shown through giving, kind words, help­fulness, and consistency between words and deeds. In one of his lifetimes, the Bodhisattva took birth in a family of brahmans which was renowned for purity of con­duct and spiritual devotion. And as a result of merit earned in former lives, he found himself showered with wealth, dis­tinction, and fame. As a youth, the depth of his intellect was matched only by his eagerness to learn. He soon mastered the arts and sciences so well that the brahmans revered him as an au­thority dependable as the law itself; to the ksatriya warriors, he was as venerable as a king. To those thirsty for knowledge, he seemed a reservoir never empty; to ordinary people, he seemed a god. the Lord Buddha obtain the Dharma for our benefit. with deep respect and close attention. Pg 11- Once when the Buddha was still a Bodhisattva, the vast store of meritorious actions amassed in many previous lives caused him to take birth as a king of the Shibis. Respectful toward the elders from earliest childhood and modest in his behavior, he was deeply loved by all his subjects. Blessed with boundless energy, discretion, majesty, and power, knowledgeable in many sciences, and favored by fortune, he ruled his subjects as if they were his children. In the Bodhisattva, all the finest qualities, both spiritual and worldly, blended harmoniously despite their contrasts. Glory, which mocks those who win high rank by wrong means, glory, which brings calamity to fools and intoxicates the feeble-minded, had found a true dwelling place within him. Any gift that comes from the heart and is upon a bestowed worthy recipient will produce a great result. No gift of such a nature, however small, is without merit. Pg 21 – Once, when the Buddha was still a Bodhisattva, he lived as a great king of Koshala. Energy, discretion, majesty, power, these and other royal virtues were his to the highest degree. Yet the strength of one quality surpassed all others: his talent for gaining prosperity. Enriched by this felicitous ability, his other qualities shone all the brighter, as the splendor of moonlight increases in autumn. Fortune followed him everywhere like a lover, abandoning his enemies and holding his followers dear. Although his sense of fairness prevented him from harming any living being, his fortune was such that his adversaries did not flourish even though he refused to oppress them. Pg 22 – cause of happiness. More than ever before, he strove to practice good conduct; more than ever he followed the restrictions on holy days. the virtuous never shrink from practicing charity. Who, then, when safe and happy, should not be charitable? Once, when the Buddha was still a Bodhisattva, he took birth as the son of a good family. Blessed with boundless energy and great good fortune, he became head of his guild. He acquired a large estate, and by his fairness and integrity in business, earned the deepest respect of all. In addition, his study of various branches of the arts and sciences purified his mind and produced qualities which, together with his noble virtues, brought him honor even from the king. Devoted to the precept of giving, he constantly endeavored to share his wealth with the people. The mendicants praised his name far and wide, spreading his reputation for charity in all directions; they trusted him entirely, becoming bold enough to tell him their desires freely. For his part, untouched by avarice, he never held back his wealth, either for his own pleasure or to gain influence over others-for he found it impossible to witness any sort of suffering and refuse to help. Pg 35 -At one time when the Buddha was still a Bodhisattva, he was born in an illustrious family and later became head of his guild. He radiated generosity and morality, and excelled in sacred learning, self-discipline, and spiritual knowledge, embodying both wisdom and humility. Blessed with such boundless riches, he seemed like Kuvera himself. Charity was for him a perpetual practice-and so he became a constant source of wealth. Best of almsgivers, he lived only to benefit humanity; truly oblivious to all manner of greed and selfishness, he soon came to be known as Avishahya, `the Invincible One’. He was as happy to see beggars as they were to see him: At first sight, both knew that their fondest wish had been granted. He was, indeed, incapable of refusing any request, and his great compassion left no room in his heart for attachment to wealth. His highest joy, therefore, was to watch the mendicants carry off the finest objects from his home. He saw those so-called goods for what they were, sources of desire and discontent that would quickly lead to dissatisfaction without any apparent cause. who then, being human, should not be charitable? In the middle of a forest was a clearing once frequented by ascetics. There the earth was carpeted with soft green grass; rich soil put forth flowers and fruits in lush profusion, and trees and greenery of all sorts abounded. Bordering this lovely spot was a sparkling river as blue as lapis lazuli. In this forest, the Bodhisattva lived as a hare-an animal that shone with such goodness, such vigor, such strength and beauty that all the other animals in the forest looked to him as their king, none fearing him, none causing him fear. Satisfying his needs by simple blades of grass, wearing his own fur for the ascetic’s garments, he glowed like a Great Being. Everything he thought, everything he spoke, everything he did was motivated by a friendliness so pure and simple that even those beasts usually given to wickedness became his students and friends. how wonderful it is when displayed by householders! through samsara for the good of the world, he was born as the child of an illustrious Brahman family whose purity of conduct was an ornament for the earth. As the full and spotless autumn moon beautifies the heavens, so did the birth of Ajastya enhance the luster of his family. In due time, after he had obtained the sacraments called for by the sacred texts and traditions, and after he had studied the Vedas and their many rituals, fame of his knowledge spread far and -aide. The offerings he received from charitable lovers of virtue swiftly multiplied into considerable wealth. And, in turn, as an expansive cloud showers the fields, he regaled with treasures his relations and friends, beggars, guests, and teachers-the distressed as well as those worthy of honor. And so the bright glory of his learning, augmented by his generosity, shone forth all the greater, just as the beauty of the moon increases in autumn. The truly compassionate take no heed of their own pleasure; it is the suffering of others which concerns them. At a time when the Bodhisattva was established in the practice of compassion, intent on becoming a refuge for all beings, he set his mind on increasing the qualities which benefit the world-giving, self-discipline, devotion, and love for all beings. And so he was born as a king named Maitribala, ‘He Whose Strength is Kindness’. If ordinary beings are not capable of even appreciating the Bodhisattva’s actions, how can they follow his example? Once the Shibis were ruled by a king whose every action was crowned with virtue. Samjaya was his name, a man whose valor, discretion, and modesty kept his passions firmly in check, and led him to become victorious and mighty. Because of his great virtue, Glory, faithful as an honest lover, followed him as fervently as a lion guards its den. Those whose minds are virtuous cannot be seduced by the enticements of the wicked. Knowing this, strive to be pure in heart. Long ago, the Bodhisattva, due to merit accrued during previous lives, was born a king. All the lesser rulers bowed before him, and so he ruled in peace, having no need to subdue either his own or other peoples. His claim to the throne was universally acknowledged, and his relations with other countries were calm and balanced. His land was free from every kind of disturbance, disruption, or disaster and all his subjects obeyed his commands without question. Neither adversity nor the majesty of sovereign power will diminish the compassion of the noble minded toward sentient beings. For countless lifetimes, the Bodhisattva performed virtuous actions, thoroughly actualizing the meaning of giving, self-discipline, responsibility, and compassion. When his every action was directed toward the benefit of others, then, it is said, he became Shakra, Lord of the Gods. What is it that keeps the virtuous on the path of good conduct? Their sense of shame and decency. Once the Bodhisattva took birth as the son of illustrious brahmans, well-respected for their ancestry and their conduct, a family which upheld traditional customs, self-discipline, and practice. He received the usual sacraments and purification rites in due course, and at the proper age was gent to live with a teacher distinguished for his learning, his birth, and his exemplary conduct. The virtuous are always reluctant to follow a low road. Even when sick with heavy sorrow, their constancy allows them to maintain a steady course. The Bodhisattva, during his many lives of striving to benefit beings by means of the special qualities of truthfulness, generosity, tranquility, and wisdom, once took birth as a king of the Shibis. Embodying the Dharma and self-discipline, he was able to secure the welfare of his subjects much as a father cares for his children ― influencing them to increase their virtuous qualities and to turn away from wrong actions. And so his subjects rejoiced both in this world and the next. The king administered justice according to the Dharma, treating both kinsman and commoner alike. And because the people were encouraged to cultivate right action and to obstruct the path of wrongdoing, a ladder to the heavenly realms gradually came into being. When one dwells in the Dharma, the truth is enough to dispel destruction. What more could one say of the good that comes from observing the Dharma? Thus, one should follow the Teachings. During one of his many lifetimes, the Bodhisattva was a very wise ship captain. Great Beings, because of their innate acuity and clarity of mind, invariably surpass any other great men in the world in whatever art or science they undertake. Thus it was that during his life as a helmsman, the Bodhisattva possessed all the extraordinary qualities one could imagine. If those who practice good conduct successfully realize virtuous ideals in this life ― how much more will they be able to realize virtuous ideals in the next! Therefore strive for pure conduct. Once the Bodhisattva was born as king of all the fishes that lived in a certain large lake ― a lake with lovely waters adorned by water-lilies and red lotuses, by lotuses of white and blue, its surface sprinkled with the blossoms of neighboring trees. This was a lake much favored by swans and ducks and geese. By long and sustained practice, good or wicked actions become inherent in one’s nature to such a degree that in future existences they are performed without effort, as if in a dream. Thus it was that the Bodhisattva was intent on acting solely for the good of others, even in his existence as a fish. Not even fire can destroy the power of speech purified by truth; knowing this, who would not always endeavor to speak the truth? Once the Bodhisattva lived in a forest as a baby quail. Together with his many brothers, he lived in a nest built with great care by his parents on a vine in the middle of a thicket, firmly protected by a strong covering of grass. Having emerged from the egg only a few days before, his wings were not yet developed, and in his small, weak body his tender limbs were barely discernible. Drink is the source of many ills. Knowing this, the virtuous attempt to influence others against drinking even more so do they deter themselves. Once the Bodhisattva manifested as Shakra, Lord of the Gods. Compassion having purified his mind, every one of his actions was directed toward fostering the happiness and good of others, through deeds of giving, morality, and self-restraint. Although he deeply enjoyed all the sensual pleasures which were due the gods, not once did he relax his exertions for the benefit of the world. The life of a householder is beset with concerns that are in conflict with spiritual pursuits; those searching for the Truth gladly spurn such a life. Once the Bodhisattva was born into a family of great wealth, renowned for its virtue and good conduct, and highly esteemed by the people. Like a refreshing well to those who led good lives, this family shared their store of treasures and grain with a and Brahmans, and opened their home to friends and kin. The poor and the needy were sustained by their gifts, while artisans received their patronage and protection. Even the king was pleased to secure their favor and hospitality. One who has learned to appreciate the happiness of detachment will turn away from worldly pleasures, avoiding them as if they were bringing him disgrace or harm. Once the Bodhisattva was born to an illustrious family of Brahmans renowned for their virtues and freedom from vice. He had six younger brothers whose bearing and traits were similar to his own, and a sister, all of whom imitated him in every way, out of affection and esteem. Assumed to possess a virtue they lack, the virtuous are spurred on to attain it. Considering this, all should strive for virtue. Once the Bodhisattva lived as a king’s treasurer, renowned for his learning, his nobility, and his modest behavior. He had both lofty aspirations and a fine intellect, and a love for honesty in business as well as for the study of the many branches of science. These virtues gave his speech an eloquence for which he had become well-known. His compassion overflowed; through gifts of charity, he dispersed his wealth in all directions ― it was no wonder he was considered the jewel of householders. The many virtues which ornamented his nature, a love of spiritual things and the like, caused the people to revere him above all others. Those who can master their anger are able to pacify their enemies; those who cannot, inflame them. Once the great Bodhisattva was born in this world to a certain noble family of brahmans renowned for their practice of virtue. Favored by the gods and honored by the king, they owned a large and flourishing estate. From early youth, the Great Being devoted his energies to cultivating the virtue of learning, so that by the time he was fully grown, his fame had already spread widely. As swiftly as a hero becomes known on the battlefield, as rapidly as a beautiful jewel gains note among collectors of gems, so quickly did his reputation grow among the learned. Even when in distress, the virtuous display right conduct of a kind impossible for the non-virtuous. How much more perfect their conduct must be when they are favored by fortune! Once the Bodhisattva took birth as a king of the geese named Dhritarachtra, ruler of a vast flock living on Lake Manasa. Sumukha was his commander-in-chief, the protector of the king’s hundreds of thousands of subjects. Only slightly less exalted than the king himself, Sumukha was well skilled in the management of the king’s affairs, for he knew clearly what constitutes correct policy, and had a prodigious memory for events spanning vast extents of space and time. The compassion felt by the virtuous for their benefactors does not diminish, no matter what injuries those benefactors might later inflict upon them: Such is the gratitude shown by the virtuous, Such their forbearance. Once when the Bhagavat was still a Bodhisattva, he took birth as a wandering ascetic known as the Wise One, Mahabodhi. While still a householder, he had acquainted himself thoroughly with most branches of worldly learning, particularly the fine arts. After renouncing the world, however, he directed his mind exclusively to the study of the Dharma, in hopes of bringing benefit to all sentient beings. When the virtuous are injured by others, they cry less for their own pain than for the merit thus forfeited by those who have injured them. At one time the Bodhisattva showed just this. The truly compassionate show love even for those with murder on their minds; even when they themselves are in great distress, they would never desert such beings. 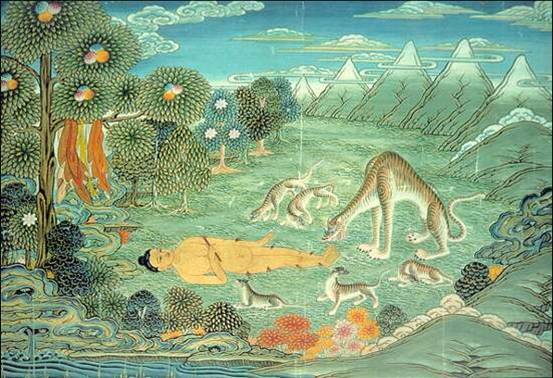 Once the Bodhisattva took the shape of a sharabha deer who lived in a forest far away from the sound of man, a forest inhabited by many different kinds of animals. Trees and shrubs and thick high grass covered this remote land, which was untrod by travelers and bare of any trace of carts or other vehicles. It was, indeed, a land traversed only by rivulets and ant trails. Those who walk the path of virtue can win over the hearts of even their fiercest enemies. In the heart of the Snow Mountains is a blessed region. Watered by mountain currents clear as crystal, its soil is finely carpeted with herbs of healing powers. Hundreds of forest trees display an extraordinary variety of fruit and flowers, and throngs of birds fill the air with song. In that forest the Bodhisattva lived as a monkey king. But even in that bestial form, his mind was formed by the constant practice of giving and compassion; depending on such friends as these, jealousy, selfishness, and cruelty would have nothing to do with him. The immense forbearance of those who practice patience makes nothing too great to bear. Because wrong views have hellish consequences, those who follow such views are especially deserving of the compassion of the virtuous. Pain is a prize to the virtuous, if its end be the happiness of others. Once the Bodhisattva took birth as a huge elephant who lived in a forest far remote from civilization. A lake both deep and wide ornamented this wilderness, which was surrounded on all sides by a barren desert. But the forest of this oasis was well-suited for elephants and many other forest creatures. The trees were laden with flowers and fruit; young shrubs and grasses carpeted the earth. Mountain ridges and plateaus bordered the forest, as if detained there by its charm. Even a chance meeting with a virtuous person promotes well-being. For this reason alone, those who long for awareness and balance in their lives should seek out the virtuous. Once the Bodhisattva was born into the illustrious royal family of the Kauravas, into a dynasty known the world over for its glory. It was a family held in deep affection by the people; even their proud neighbors had become their vassals, partly because of the sheer splendor of the Kauravas’ power, but also because of the purity of the family’s intentions. Those once struck by the weariness of existence are distracted by nothing on their road to enlightenment not even by the brilliance and lure of royalty. A one time when our Lord was still a Bodhisattva, he looked upon the world and found it full of the sufferings of disease, old age, and death, of separation from loved ones, of the calamity upon calamity which beset every sentient being. Knowing that beings had no refuge, no guidance, no protection, he was moved by compassion to work for their liberation; he wished to gain the highest happiness even for those unknown to him and averse to his teachings. Forbearance exists only if there is an opportunity to show it. Knowing this, the virtuous appreciate those who would harm them, considering them benefactors. Once the Bodhisattva took birth as a wild buffalo in a remote forest. Grim of appearance and caked with mud, he was as forbidding as a rolling thunder cloud of darkest blue. But even in that brute animal state where ignorance prevails and the concept of virtue is difficult to come by, his keen understanding led him to practice virtuous actions vigorously. He had served compassion so long it would not leave him. Even when provoked, the virtuous, being unaccustomed to such conduct, are incapable of committing a wicked act. Once the Bodhisattva lived in a forest as a woodpecker, renowned for his beautiful feathers, so brilliant and many-colored. Owing to his inherent compassion, he refused to follow the sinful instincts of his kind, and abstained from injuring other living beings. He fed on sweet and savory flowers, fruit, and young shoots, and was content.